Like a well-placed scarf or just the right shoes, accessories can transform one’s clothing into a certain “look.” So, too, can just the right accent flower in a bouquet or vase arrangement. With their cosmopolitan distribution and elegant, round fruit, the hypericum berry is the perfect addition to any floral arrangement. Sleek, yet natural looking, a few stems of these green, red or orange berries can add a certain “je ne sais quoi” to a bouquet of roses or a fistful of daisies. Add them to almost any bunch of flowers for a look that’s sure to be in style. An absolutely fascinating plant, hypericum berries are the dry fruit of the St. John’s Wort plant. Touted for centuries as a tonic in folk remedies, this plant has been studied extensively by modern pharmacologists. Found to contain two important chemical compounds, hyperforin and hypericen, St. John’s Wort is now prescribed and sold over the counter in pills and teas to treat mild depression. As an ornamental, this plant can improve the mood with just one glance, and the long stems of firm, round berries can absolutely transform a common bouquet into something quite extraordinary. If you are looking to elevate an arrangement, simply place two of these stems- one towards the center and one on the outside- among the other flowers. Available all year round, green hypericum berries are a great choice for spring and summer flowers and help turn even flowers from a florist cooler into a “just picked” wildflower bouquet. Their woody stems are sturdy, but narrow enough to not crowd a vase. Natural looking and long lasting, their addition to a vase of flowers can soften the look while actually strengthening the stems of other daintier flowers by helping to hold up heavier heads of gerber daisies or roses. Cutting them slightly shorter and placing them around the outside of alstroemeria or spray carnations can give you an arrangement that lasts for two weeks or more. 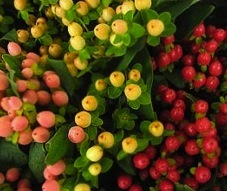 For a fall and winter floral arrangement, consider the red or bronze-colored hypericum berries. Even out of water, these stems will keep their color, so they are a great addition to a handmade wreath or tucked into the bow of a fancy wrapping job. Alone in a vase or mixed in with evergreen boughs, they add a splash of color and a sense of the outdoors in even the coldest months. Accessorize your flowers with a little hypericum berry bling, and you’ll never have to worry about boring bouquets again.